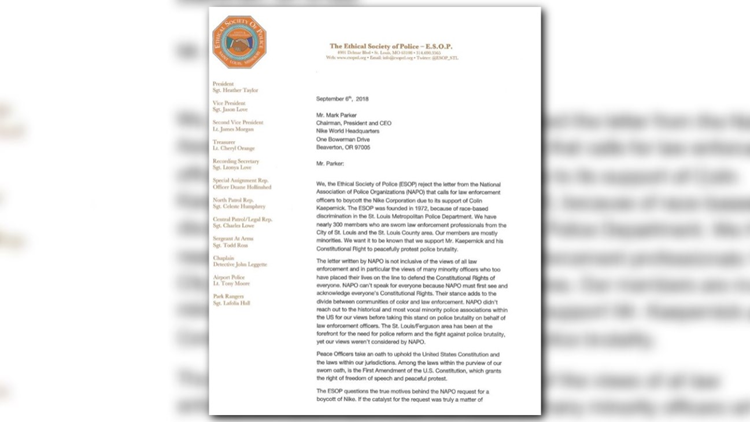 The organization says its rejecting the National Association of Police Organizations request for law enforcement officers to boycott Nike due to its support of Colin Kaepernick. ST. LOUIS - The St. Louis Ethical Society of Police has written a letter in support of Nike’s latest ad with Colin Kaepernick. Gray believes it’s outrageous for the National Association of Police to speak out now, when they’ve been silent on other issues. “Where is the national association of police officers when our president doesn’t fly the American flag at half mast for a patriot, John McCain?” says Gray. We asked Gray if Kaepernick’s protest involving the national anthem and the flag, should diminish his message. “I support the flag. I fought, not just for the symbol of the flag, I fought for the substance of the flag. And that’s what Kaepernick is trying to get people to understand. He’s protesting the substance of what that flag should symbolize - freedom, justice, equality,” he says.